Here goes nothing, my first paper review. Justin of Blank and Write sent me this note book out of the goodness of his heart. I wasn’t about to let it go to waste by not reviewing it. This is a custom note book by Curnow Bookbinding & Leatherwork for Blank and Write. These Backpocket journals are 3.5" x 5.25" and they have 48 pages. If you are familiar with Field Notes, these are the same size. These retail for SGD$22 per pack, with 3 note books per pack. The Blank and Write journal came in the white Tomoe River paper though you have an option of creme option, available from Curnow Bookbinding and & Leatherwork. Blank and Write’s Backpocket journals came decked out with Tomoe River. If you are not familiar with Tomoe River paper, it is a very thin paper (52gsm) from Japan. Though it is just half the thickness of copy paper, it takes fountain pen inks like a champ. My fountain pen nibs just glides on the paper. There are no feathering and just very slight bleedthrough when I tried flexing on the paper. 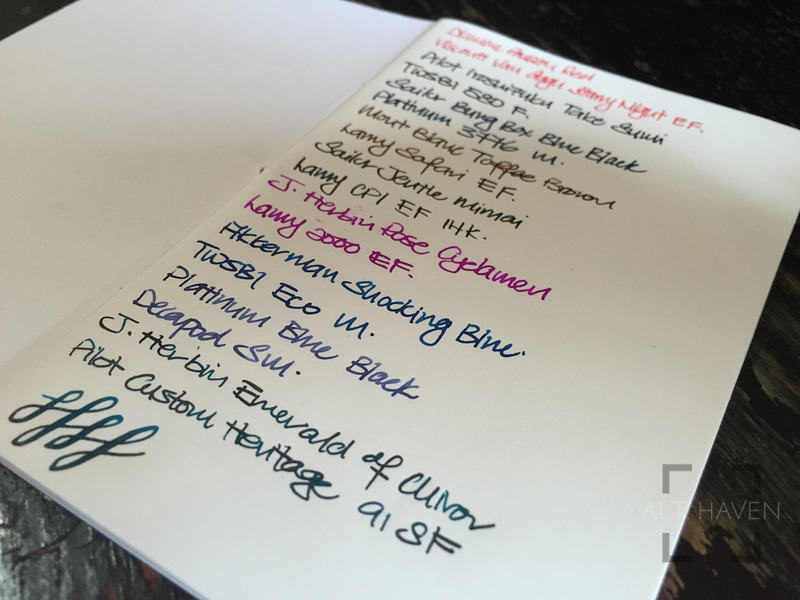 Sheen is very prominent on the Tomoe River paper if the ink has such properties. Due to the thinness of the paper, ghosting is inevitable. However, this doesn’t bother me, I wouldn’t hesitate to use both side of the note book. Overall, the Blank and Write Backpocket Journal Tomoe River Edition (oh my, what a mouthful) is a great little note book. It is an upgrade to those who enjoy the Field Note form factor but prefer writing on quality paper. My thanks to Justin once again for providing me the note book. Check out Justin’s site here. Disclaimer: I have received this product free of charge. This has in no way influence my opinion on the product reviewed.